Recent Loyalist Marches once again expose British political policing in Ireland. taken place in Belfast by a number of loyalists. This parade has been facilitated time and time again by the RUC. The policing and reaction to the loyalist protests stands in stark contrast to the treatment meted out to Republicans who have taken part in or organised un-notified parades. In January 2011 hundreds of Republicans marched in Lurgan, Co. Armagh to highlight the internment of Veteran Republican Martin Corey. Marching through a nationalist town on a Sunday afternoon, quietly and peacefully, the marchers where met by the RUC who shouted through loud hailers that they were taking part in an illegal parade, signs erected at the side of their landrovers spelled out that prosecutions would follow and every participant was recorded and followed on police video cameras. Not long after this march a number of people were awakened at 6am by the RUC, taken from their homes to an RUC station and questioned about their involvement in an "illegal parade". Released later that day they were informed they would be facing court proceedings. In March 2012, 14 Republicans sat through a three day trial accused of taking part in an "illegal parade". All 14 people were "convicted" with participating in an illegal Parade; two people where further convicted of organising the parade. All 14 people were given fines ranging from £300 to £700, many refused to pay their fines and subsequently spent a week in Maghaberry and Hydebank Wood prisons. This stands in stark contrast to the weeks of "illegal" parading by the loyalist flag protesters. The response in general from the RUC has been interesting to say the least. No loudhailers, no signs promising prosecution, no organisers arrested; the RUC facilitate this march weekly and only now after 12 weeks of "illegal" parading have the RUC even used the terminology "illegal" Parade. The loyalist flag parades have seen days of rioting, homes under attack in the Short Strand and countless roads blocked, and indeed several members of the RUC injured and one almost murdered in her car. This is a far cry from the peaceful parade in Lurgan that saw 14 people brought before the British Courts. The discovery after weeks of "illegal" parading by Loyalists, that the police are unsure of the legal status of un-notified parades is disingenuous. The RUC had no such reservations in arresting and charging, and the judge convicting, Republicans for holding peaceful un-notified parades. The Release Martin Corey march was met with such hostility because it tried to highlight that internment still exists. Republicans and human rights activists must not allow this state corruption to stop them highlighting Martin's case. The RUC are part of the same corrupt and rotten force that interns Martin Corey in Maghaberry prison, without charge or trial for almost three years now. 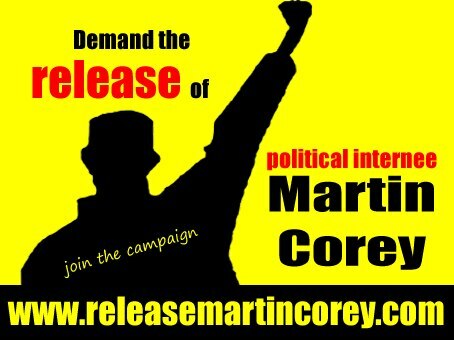 Martin Corey must now be released, his continued detention is a crime against his human rights. So who is Martin Corey? “I always find it interesting when the British government criticizes the lack of Human Rights in other countries. They don’t need to look as far as Burma or the Middle East, they could study the case of Lurgan man Martin Corey. The case of his detention appeared before the experienced Human Rights Judge Lord Justice Colman Treacy in July 2012, the judge ordered his immediate release and placed no conditions upon him. This was overturned within hours by the Secretary of State, and Martin remains detained in Maghaberry to this day. So who is Martin Corey ? As a close friend and appointed spokesperson for Martin I am in a position to know that Martin poses no threat to society, and has not engaged in any activity that could be deemed illegal. Martin Corey was sentenced to life in prison in December 1973 for his role in the killing of two R.U.C. officers near Lurgan the same year. He was only 19 years of age at the time. Martin spent the next 19 years of his life in prison, he was released in June 1992 (6 years prior to the signing of the Good Friday Agreement). Martin quickly began to rebuild his life, he set up his own business as the parish grave digger. Martin’s only interest was his family, his work and his leisure time was spent coarse fishing. On the 16th of April 2010, Martin was arrested and taken to Maghaberry prison on the order of the Secretary of State for Northern Ireland. All he was ever told was, his life licence had been revoked, no reason given, and no charge placed against him. Martin has now served more than 3 years in prison for nothing. One has to ask the question why ? His case went before the Parole Board in August 2011, they were provided with a file of “closed information” by the Northern Ireland Office. They decided to continue his detention, no doubt on instruction. We brought the case to the High Court by means of a “Juridical Review.” The case was heard in April and May of 2012, the presiding Judge Lord Treacy expressed his difficulty presiding over a case in which most of the “alleged” information wasn’t made available to him. Lord Treacy ordered Martin’s immediate release on the 9th of July and as I said, the Secretary of State stepped in blocking the release, proving the Northern Ireland Office in fact controls the law in this country, not the judiciary. In 1998, the people of the North of Ireland were promised a “new beginning,” a society with a legal system that would be open and transparent, so where is it ? If Martin Corey has committed a crime, place him in front of a judge and make him answerable. Sadly as we all know, that isn’t how things are done here. I visit Martin in Maghaberry prison on a regular basis, he is now 63 years of age, he poses no threat to society, he has committed no crime, he paid his debt to society by serving 19 years behind bars and came out an innocent man as seen by the law of this land. LATEST UPDATE ON INTERNEE, MARTIN COREY. The concerted campaign of victimisation by the Northern Ireland Prison Service against Martin Corey continues. On Monday the 11th of February 2013, Martin and two other prisoners submitted completed handcraft projects as St, Valentine’s Day gifts for their wives and partners. The other two prisoners had visits on Tuesday the 12th of February; their loved ones went to the collection point and received their items that were 24 hours after they were collected from the prisoners in Roe House 3. Today, Thursday the 14th of February 2013, Martin had a visit from his partner, after the visit she went to the collection point as requested by Martin. She was told by prison Staff that there was no items for collection, and to call back next week. Last week, Martin completed a complaints form on the wing to be delivered to the Prison Ombudsman concerning several items that were left in for him three weeks ago, which he never received. It is Prison Ombudsman’s policy that the prisoner receives notification within 24 hours that the complaint has been received. Today, Thursday the 14th of February, Martin has still not received notice that his complaint has been delivered to the Prison Ombudsman. Martin made an emergency request three weeks ago to see the prison dentist concerning a tooth broken at gum level; he only got to see the dentist yesterday the 13th February. He was told his initial request had been cancelled due to lack of transport. I have contacted Martin’s legal team and request they contact the Northern Ireland Prison Service and Prison Ombudsman for an explanation. This blatant campaign of victimisation must be highlighted. At a POW picket in Lurgan, Co Armagh on the International Day of Action for Irish Republican POWs, October 27, Cáit Trainor who is an Ard Chomhairle member of Republican Sinn Féin from Armagh, was arrested and taken to Lurgan barracks where she will be held until Monday. From there she will be taken to Hydebank jail in Belfast to serve a two-week sentence imposed in March this year at Craigavon courthouse. Cait who is Chairperson of the Release Martin Corey Campaign was fined for ‘participating in and organising’ a march through Lurgan in January 2011 in support of Martin Corey who is interned without trial in Maghaberry jail, Co Antrim, since his licence was revoked by the British secretary of state in 2010. Cáit refused to pay the fine of £700 imposed on her and so today was arrested after once again highlighting the plight of the POWs interned without charge or trial, and also by remand, in Maghaberry jail. Cait’s family would like to thank everyone for their messages of support, that it is appreciated very much. Cait refusal to pay the fine is a principled stand in defence of her steadfast republican beliefs, beliefs that will not be deterred by the unwanted enforcers of crown law in Ireland.